We all know social TV is here to stay. Well, a new online study from Accenture’s Media & Entertainment industry group, shows exactly how people’s viewing habits are changing. 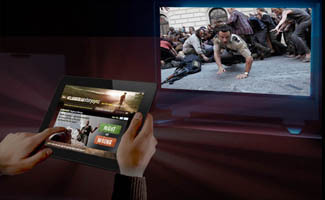 90 percent of viewers watch some video content over the Internet, with the tablet seeing the biggest increase. 77 percent regularly use a computer while watching television, an increase of 16 points from just a year ago. But people also said their simultaneous computer usage is mostly unrelated to the programs they are watching. An exception was the use of tablets, which correlated more closely with what consumers were watching compared to laptops or smartphones. Only 17 percent of people using tablets during TV time said their activity was unrelated to the TV content they were viewing. Tablet use during television viewing also saw the biggest increase in the past year, soaring from 11 percent to 44 percent, despite fewer people owning them compared to computers or smartphones. The survey also found that consumers are increasingly using local online video service providers, an increase from 37 to 40 percent, a similar amount to the decrease in use by global providers like Netflix and YouTube. And a majority of respondents identified traditional TV broadcasters as the providers they trusted most to offer video over the Internet on their TV screen. excellent job with this. Also, the blog loads extremely quick for me on Chrome.